If you want an NES Classic Edition (and you should) but don’t want to pay hundreds on eBay (and you shouldn’t), you’re in luck. ThinkGeek has a few in stock that its parent company, GameStop, mysteriously didn’t sell back when everyone was trying to buy them. They’re on sale right now, and will probably run out within an hour. But the catch is they’re not just selling them straight out — you have to buy some swag along with each console, bumping the price to a minimum of $140. Money-grubbing conspiracy, you say? How could you think such a thing of a respected company like GameStop? Anyway, it’s not like you have a choice. U.S. only, and one per customer, please. 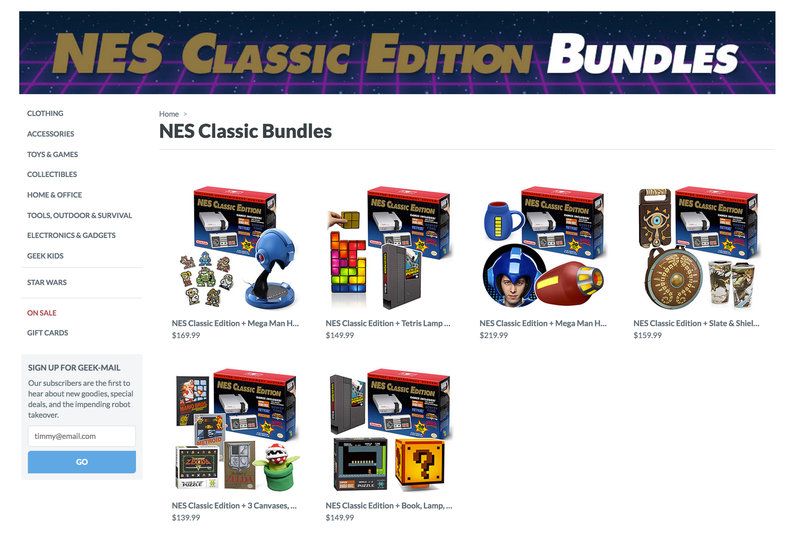 There are six different bundles, each centered around Zelda, Mario, Tetris or Mega Man. You get the NES Classic and a few knick-knacks, like a Sheikah slate notebook or Mega Buster mug. The one pictured up top seems the most practical — who wouldn’t want to decorate their retro gaming cave with a few old NES game box posters?